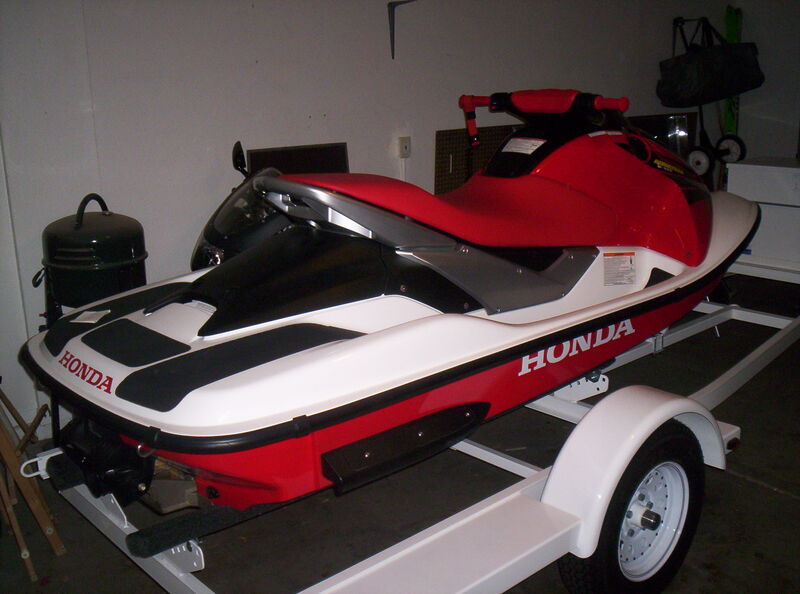 Perfect condition, for one watercraft, white, storage in the front. 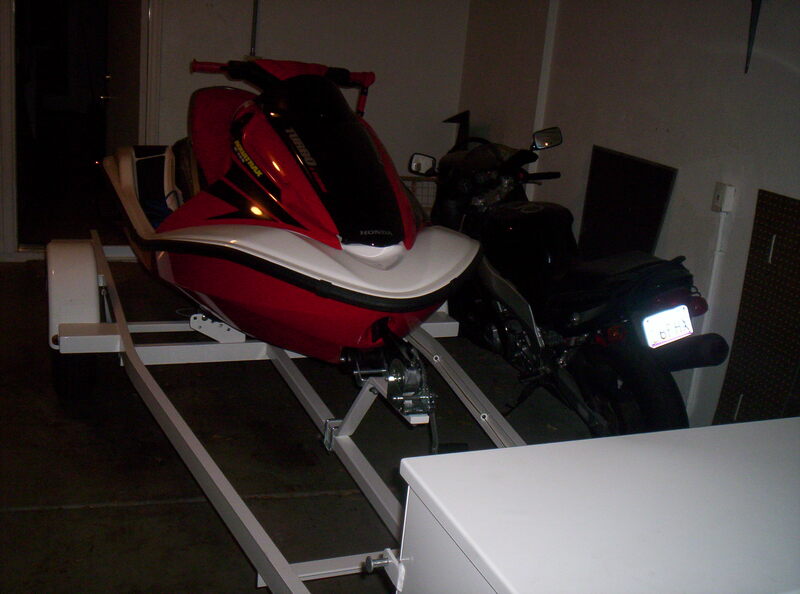 Used only once to transport a Turbo AquaTrax from Arizona to Los Angeles. We are selling the trailer only. 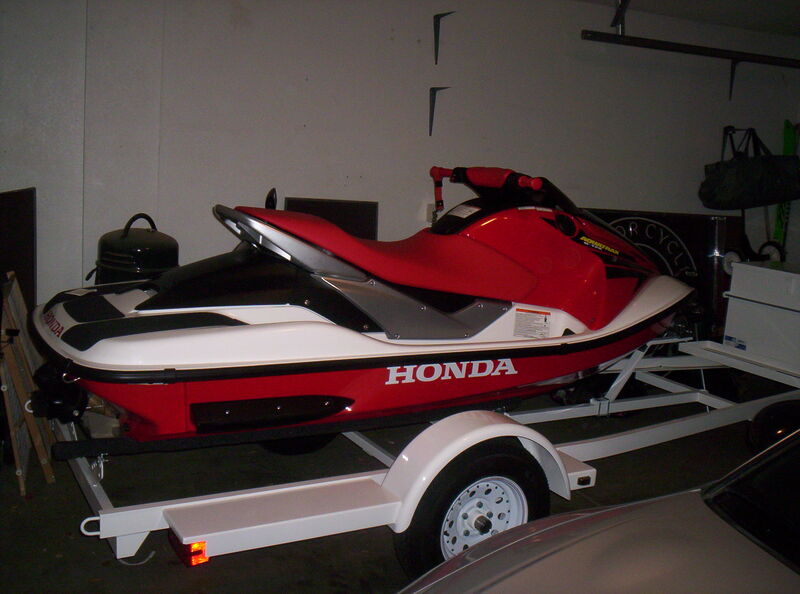 The watercraft is not included. We have a 1995 44’ black 18,000 pound GVW tri-axle Timberwolf Race Car, Cargo, or Vendor Trailer with a curb side, (RH), 36” X 72” walk in door with a step. It has three LH 6’ high by 10’ long, top hinged vendor doors and the rear of the trailer tapers off behind the axles into a ramp door with an aluminum diamond plate flip out extension to break the angle for low vehicles. Almost half of the trailer can be opened up for a breeze on hot days. It has three 6,000 pound rating torsion axles with electric brakes on each one with Chrome 16” Wagon Wheels and 235X85R16 Load Range E Goodyear Highway Tread Tires rated at 3,042 pounds capacity each. It has a built-in battery with an electric powered hydraulic center landing gear with 2 adjustable legs on the outer front corners of the box. The 2 5/16” ball hitch is a adjustable in height. It is wired for a breakaway battery brake unit. The trailer is approximately 10’ overall height, (approximately 8’ inside), is 102” overall width, (97” overall inside, 81” between wheel wells), has approximately 35’ on the floor, and has an additional 8’ X 8’ X 4’ high storage area in the nose. Inside belly storage is available if needed or it can be set up as a vendor trailer with an 8” Deep X 4’ Wide X 26’ Long recessed seating area in the center of the floor. The headliner is white for reflection with three 12 volt lights which run off the tow vehicle and the interior sides are paneled in plywood. There are several E-Track sections on the floor for tying down vehicles and there is a Heavy Duty 12 volt Superwinch on the front of the floor with about 50’ of cable. It is also equipped with a 110 volt power box for bringing in outside power if needed. The trailer is not currently lettered. It tows excellently with or without a load behind a 1 ton dually crew cab, which we also have available if needed. We have a 1990 28’red 12,000 lb GVW tandem-axle Pace Race Car, Cargo, or Vendor Trailer with 3 curb side, (RH), 5’ high by 9’ long top hinged vendor doors, a LH 48” X 78” walk in door with a step, and a LH 4’ wide by 3’ high tool box or generator door. The rear of the trailer tapers off behind the axles, (beavertail), into a 7’ 6” tall ramp door with a wooden flip out extension to break the angle for low vehicles. Almost half of the trailer can be opened up for a breeze on hot days. It has two 6,000 pound rating torsion axles with electric brakes on each one with white 8 bolt 16” Wagon Wheels and new 235X85R16 Load Range E BFG (Michelin Made) Highway Tread Tires rated at 3,042 pounds capacity each. It has a built-in large truck battery box, and an in-the-floor spare tire well, a heavy-duty center manual front landing gear with an adjustable leg and a 2 5/16” ball hitch set up for Reese bars and aluminum diamond plate on the lower front section of the trailer acting as a stone shield. The trailer is approximately 10’ 6” overall height, (approximately 88” inside), is 96” overall width, (87” overall inside, 81” between wheel wells), has approximately 28’ on the floor, an additional 8’ X 8’ overhead viewing or storage platform on the front of the roof with a front mounted ladder for access. The walls and the headliner are wood-grain ¼” pegboard with insulation behind them and the floor is covered in green indoor-outdoor carpet. There are three overhead vents and three overhead 12-volt lights, which run off the trailer battery. There are several D-rings on the floor for tying down vehicles. On the RF inside corner, there is removable shelving that is 3’ wide by 12’ long. The trailer is not currently lettered. There is also a 7’ wide rear inside hinged door that is covered with wood-grain pegboard on both sides that swings out to the LH side of the ramp door providing more display area for vending purposes. The trailer tows excellently with or without a load behind a 1 ton dually crew cab, which we also have available if needed. It is very sound mechanically but needs some cosmetic repairs on the exterior aluminum to make it nice. Trailers are FOB Detroit, Michigan and Other Locations. For directions to Tracy Performance, click here.